"The is the real stuff. Genuine Maryland crab soup, direct from the Chesapeake Bay area." Place whole tomatoes, water, lima beans, corn, sliced carrots, chopped onion, Old Bay seasoning, and beef broth, in a 4 quart pot. Heat to simmer, cover, and cook for 5 minutes. Stir crabmeat (and crabs claws, if desired) into tomato and vegetable mixture. Cover and simmer 10-15 minutes longer. Serve hot. Good stuff. 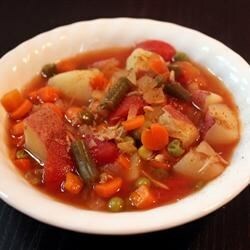 I added more Old Bay & used frozen soup veggies, a little black pepper & a clove of garlic. It was awesome & will no doubt be even better tomorrow.